Ready for School? Backpacks, Folders, Labels, Oh My! It's that time again . . . school is coming just around the corner. So crazy because it feels like summer just began. With the end of summer comes back to school shopping. We have backpacks, lunch boxes, folders, pencils, crayons and more to purchase. But you know the item I use year after year to make the most of our supplies? LABELS! Inevitably, it always seems everyone wants to claim everyone else's supplies. But we put a stop to that in our house and at school by putting fun, colorful personalized labels on all of them. 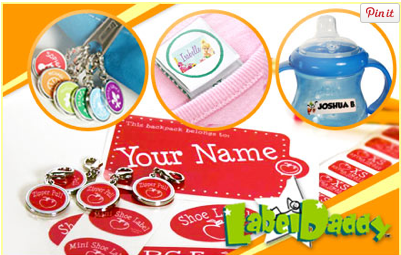 One of our favorite companies is Label Daddy - and right now you can save 20% on Label Daddy labels for Back to School! Don't forget to label all clothing, sports equipment and other personal belongings your kids bring to school, camp, sports leagues, day care, and other places. It's amazing how those little labels keep stuff from disappearing. Label Daddy labels are super durable, peel-and-stick washable labels - they're washer/dryer safe, microwave safe, dishwasher safe and even UV resistant so they won't fade! The kids will like it because they can design their own labels! They can pick from tons of colors, sizes and logos, including Disney and Marvel characters, MLB, NBA, and NHL team logos, and more. Use code USFAMILY20 at checkout to get your 20% off.